Over the past few days, it has come out that Mithril (MITH) has been involved in illegal voting for Binance’s monthly Community Coin vote. They have been engaging in organized cheating and I am about to show you how they are doing it. If you know anything about the Community Coin vote, you know that 1 BNB = 1 vote. You can have up to 500 BNB per vote, so 1 voter can have have a max of 500 votes if they hold 500 BNB. Say what you will about this voting system, it is the way it is. However, Binance has been clear that any creation of fake accounts or distributing BNB en masse to get more than 500 BNB per voter will be severely punished with a disqualification. In come Mithril (MITH) — a cryptocurrency that thinks it can get away with transferring 500 BNB to 160+ Binance accounts for the purposes of getting 80,000+ votes. Yes, that’s right: 2–3 ETH wallets are funding 80,000 votes. And I am going to show you how step-by-step. Please share this so Binance sees it and we expose Mithril for cheating because this is completly unacceptable. They should be disqualified immediately and Binance should reconsider some of its current voting mechanisms. If you open the BNB contract, you will find that random accounts have sent BNB to many different wallets — suspiciously, 500 at a time. Upon closer investigation, it was found that this address (0xa25c9dd8ef26971cf58ef5045b098930947f5708) has a transaction of 402 BNB sent to the official Binance wallet (0x3f5ce5fbfe3e9af3971dd833d26ba9b5c936f0be). So that tells us that this former address (0xa25c9dd8ef26971cf58ef5045b098930947f5708) is a temporary Binance-generated wallet used for deposits. OK, so we established that its a deposit address, but what does that tell us? Quite a lot actually. Let’s look deeper. This temporarily-created deposit address has one deposit from this address (0x20CB24c78bdb1BF17E6A1D4E2fd1cC80AA1a5c5b). Wow, that’s a lot of BNB! Almost 500 BNB being sent every minute. And this has been happening all day as of writing this with the last transaction being 3hrs and 2 min ago: a total of 437 transactions! That’s a lot of manipulated votes. Calculated, that’s over 80000 BNB which is 80000+ votes! 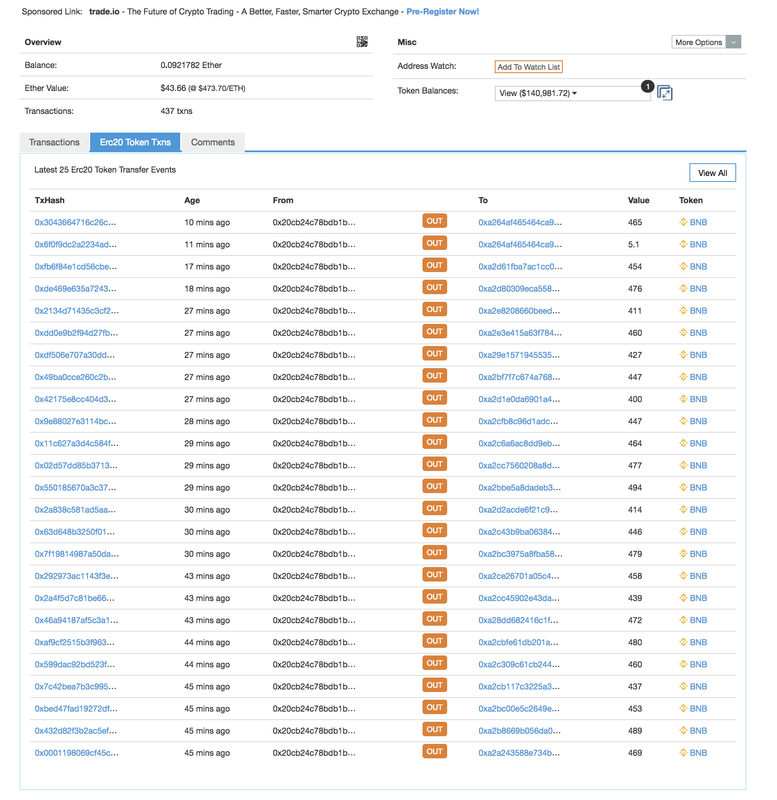 EDIT: Since this screenshot was taken and the information came out, resulting in thousands of reads, the account in question has opted instead to send 100–150 BNB at a time instead until eventually moving the responsibilities of sending BNB en masse to presumably another address. However, how do we know this is Mithril? — it could be anybody. 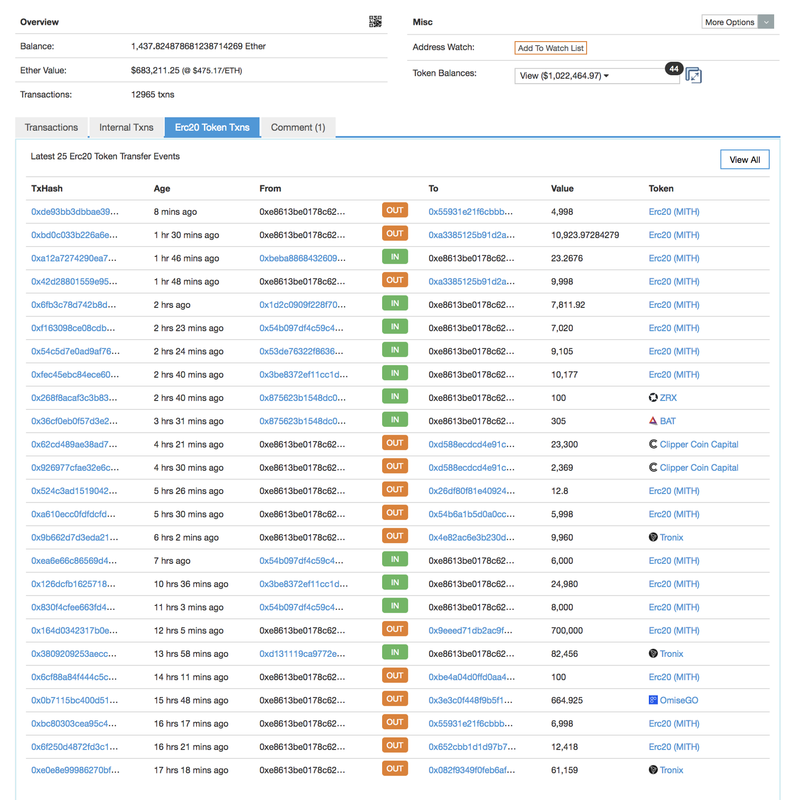 Maybe we can find out by looking at how this BNB was sent by looking at where the ETH Gas came from for these transactions. 0.1 ETH came from this account to pay for all this BNB sent. That’s a lot of MITH. Actually, this account has $8,673,549 of MITH (~18,307.1254 ETH worth). Wow! OK, that seems obvious. Exhibit #2: Another 0.2 ETH came from this address (0x3079848d0C39b920F0e9422EFc03633c628d3C0C). This address has also sent 3,200+ ETH to another address (0x9f29DfC4C195550F367947f0BCC89b3BfF1234E5) and then to the Binance wallet , probably to buy BNB tokens. However, where did this ETH originally come from…? Upon looking at the senders to the address that sent the 0.02 ETH, one finds that most of the ETH is coming from this address (0xE8613be0178c625e7f2325348D98DFb8A7Be5C59). And, you guessed it, this wallet has a massive amount of MITH tokens. MITH is down 20% in the vote for the first day. Suddenly, over the course of just a few hours, MITH zooms into 1st place and eventually takes a 10% lead during the time when the aforementioned evidence applies. This has got to be one of the most obvious cases for disqualification if Binance is serious about their rules. So, there — we’ve tracked down the account that is distributing 80000 BNB to two majority-holding MITH accounts accounting for 80000 colluded votes from 2 addresses. There may be more connections if you can find them. Nonetheless, these are thus two examples of clear voter manipulation by Mithril. This is sufficient evidence by any estimation. Please Binance, disqualify Mithril from the voting competition because this is a clear violation of the monthly community contest rules. One or a colluding group of individuals cannot distribute 500 BNB batches to many different accounts and vote that many times. In this case, over 80,000 votes were committed in this way. It goes against the entire procedure of the community vote. And on top of that, Jeffrey Huang has boasted about it slyly on Twitter thinking nobody would notice or call him out. Thank you for your time and I hope Binance does the right thing. Added Note: It has also come out that Libra Credits has been found to have manipulated the Binance Community vote by sending BNB en masse to different wallets to vote. 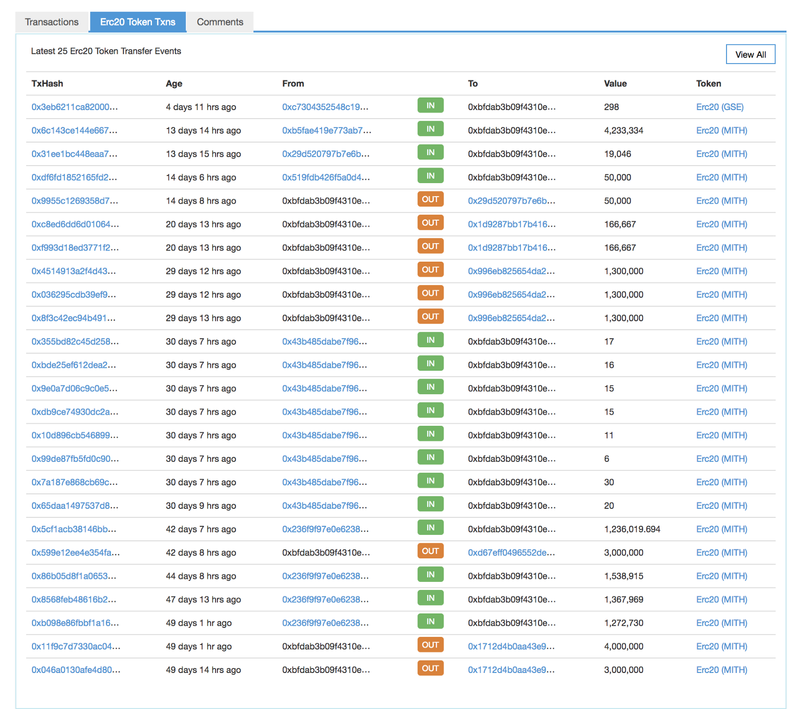 Transactions of about ~520 BNB each were sent to many different Binance accounts, totallying about 20,000 manipulated votes today. This caused them to jump ridiculous 10 percentage points in a very short amount of time.You can read more about Libra Credit’s voter manipulation here. A crypto-enthusiast writing on the latest trends.